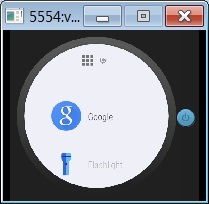 This section provides a tutorial example on how to create and run an Android Emulator for Google watches. Then I launched the vWatch AVD with "Scale display to real size" turned on. After about 10 minutes, my smart watch simulator was running on my Windows system. After clicking the power icon and waiting for another 5 minutes, my vWatch is fully working. To see the list of apps, I had to press and hold down the power icon.